Beyoncé spent the day at Dublin zoo in Ireland with her two-year-old daughter Blue Ivy on Tuesday. The XO hitmaker is currently in the Irish capital for her Mrs. Carter World Tour, but she took a break from her hectic schedule to spend the day looking at animals with two-year-old Blue Ivy. The 32-year-old singer took to her Instagram account yesterday to post a picture of her cradling the toddler while they both gazed at a group of giraffes in the distance. The blonde beauty attempted to keep a low profile by wrapping both her and Blue in woolly hats, but managed to draw attention to herself by wearing a black bomber jacket with Mrs. Carter World Tour emblazoned across the back. 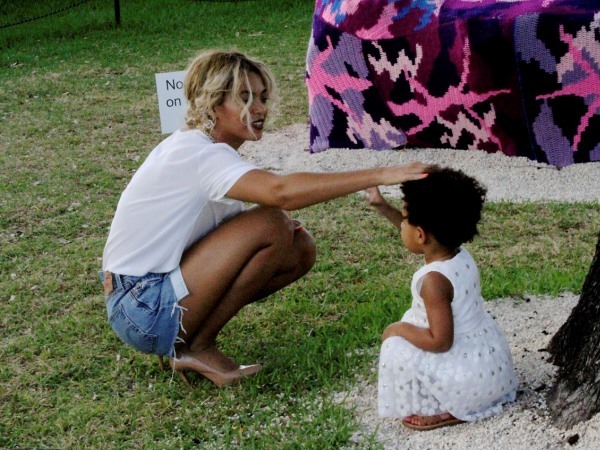 Beyoncé and Blue's trip to the zoo follows their outing to the local Phoenix Park the day before, where they spent half an hour in the playground with Jay Z. The rapper (44) and Beyoncé, along with their security team, then enjoyed dinner at fashionable eatery Coppinger Row. It seems the pair have been enjoying the culinary delights of the city, as following the Drunk in Love hitmaker's show on Sunday, the "extremely humble" couple dined at upmarket eatery Fade Street Social, which opened late just for them. A representative said previously: "Usually the kitchen is closing around then but we held on for a few minutes to accommodate them. They were extremely nice and friendly and left very happy."